It was as if twilight had begun to descend early on a murky and mysterious afternoon of an English day in Blackpool in the month of March. Ian Ward (left) congratulates Frank Conway. Generally speaking, such gloominess at the beginning of an evening is not inspiring. But, on turning in to the doorway of the town’s Masonic Hall, cheery pleasures of spring seemed to have suddenly arrived. Fraternal Lodge No 4531 is not a large lodge but has a spirit and friendliness that few lodges can match. There is an intimacy and joviality that immediately registers that an enjoyable time is to be had by all. Amongst the small membership are some of the most zealous and enthusiastic Masons, each determined to perform their allocated role to the utmost and all extending the warmest of welcomes to visiting brethren. It was into this atmosphere that principal guest Ian Ward was greeted at the lodge’s installation meeting. Ian is Chairman of the South Fylde Group, and amongst the dignitaries present to support Ian in representing the Provincial Grand Master was Blackpool Group Chairman John Turpin, along with fellow grand officers Stuart Thornber, Ron Weatherill, Roger Perry and Ted Rhodes. Adding further lustre to the procession of notables was acting Provincial grand officer David Kenworthy. 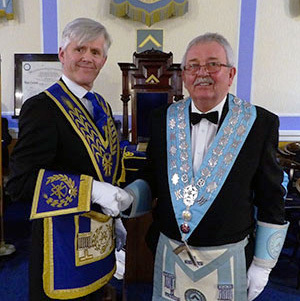 Master elect Frank Conway has been a member of Fraternal Lodge for a good number of years and has filled a variety of offices in the lodge but has, until now, been somewhat apprehensive about accepting the responsibilities of being master of his lodge. Things were about to change. Frank had decided that the time was now right for him and it was clear that his fellow members were delighted at his decision. Pictured from left to right, are: Peter Smith, Frank Conway and John Houghton. 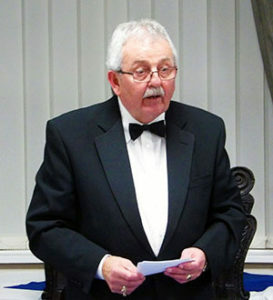 Master of the lodge John Houghton opened the proceedings in swift and efficient manner, dispatching the general business of the lodge with alacrity and purposefulness. At the announcement of the pending installation, John invited Peter Smith to occupy the chair of King Solomon in order to conduct the early sections of the installation ceremony. The ritual could not have been in safer hands. Peter has, over the years, gained a reputation as a masterful ritualist and in his easy, relaxed manner of delivery proved to the hilt that that reputation is justly conferred on him. Inviting two stalwarts of Blackpool Temperance Lodge No 5303 to assist by acting as installing wardens, Umesh Dholakia took his place as installing senior warden whilst Martin Linton filled the role of installing junior warden. Lodge member Billy Hill was likewise invited to act as installing inner guard. Presenting Frank for his installation was director of ceremonies Martin Haines and although Frank still showed some signs of diffidence, he could not have been in steadier hands. Martin is a Freemason of the first order; a superb ritualist, a man of impeccable credentials and a chap who instils confidence, even into the most reserved and timid of candidates. Frank could rely entirely on Martin. 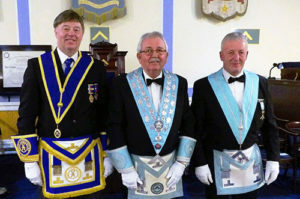 Indeed, the whole of the Fraternal Lodge team could not have provided a more solid and reassuring ceremony for Frank. Ian Ward kept his audience spellbound during his speech. In progressing through the ceremony, Peter Smith conducted the ritual with immaculate articulation, in which each sentence appeared to bolster Frank’s confidence. He visibly enjoyed it more and more as the ceremony progressed. On completion of the inner workings and after seeing Frank safely and happily installed into the chair of King Solomon, Peter passed the reins to Martin Haines to complete the proclamations and invest the officers of the lodge. Throughout the proceedings, each member of the lodge and each visiting member of the installation team produced perfect addresses. Presenting the working tools of a master Mason, Peter Louth established the highest of standards which was maintained by a scintillating delivery of the extended version of the second degree tools by master Mason Paul Kolodziejczak (a name that conjured up a variety of pronunciations during the course of the evening). John Haines provided an equally impressive oration of the first degree working tools. Everything was moving along swimmingly and Frank was enjoying every minute of it. Realisation dawned on Frank Conway that he is master of his lodge. Visiting brethren who were invited to take part in the ceremony did so with fervour and panache. Umesh Dholakia and Martin Linton of Blackpool Temperance Lodge proved that their lodge was not without first rate ritualists and group chairman John Turpin and group charity steward Ian Stirling performed superbly when John addressed the newly invested director of ceremonies and Ian explained the duties required of a charity steward and MCF 2021 Festival representative. 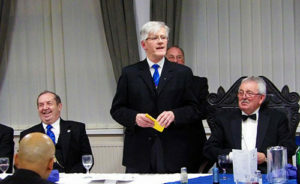 Peter Smith reinforced his reputation with a faultless rendition in his address to the newly-installed master and Martin Haines proved his superiority when addressing the wardens. There only remained the address to the brethren of Fraternal Lodge. Such a task could not have been better cast with Ian Ward producing a passionate, animated and sincere rendition of the piece. It was the perfect finale to a superb installation ceremony. By this juncture in the proceedings, Frank was visibly tickled pink. That Ian was equally impressed with the quality of the ceremony was apparent when he conveyed the greetings of the Provincial Grand Master. ‘Magnificent’, ‘superb’, ‘delightful’ and ‘wonderful’ were just a few of the adjectives he used in lavishing praise on those who had taken part. Frank’s joy was equally apparent when he presented Ian with charitable disbursements amounting to £997, consisting of £375 to the Masonic Charitable Foundation 2021 Festival, £300 to the Blackpool Masonic Building Fund, £292 to the West Lancashire Freemasons’ Charity and £10 to each of the Masonic Golf, Bowling and Clay Pigeon Shooting Societies. Frank Conway (right) presented a bouquet of flowers to Ian Ward. The joviality of the lodge blossomed still further when the throng retired to the dining suite and donned their nosebags for a fulfilling four course banquet. And, no doubt inspired by the cheeriness of the ambience, Ian Ward, in responding to the toast to grand officers, fashioned an engaging and humorous speech that perfectly reflected the mood of the occasion. Interspersing wittiness with more serious elements, he informed his audience of matters of importance to the Province, Royal Arch Masonry and the Masonic Charitable Foundation 2021 Festival. As good as the evening had been, however, there was still more to come. Junior warden of the lodge Arron Long, accompanied by George Holden at the piano, made his debut appearance as the singer of the master’s song. And what a splendid job he did! Frank may have decided that the time was right for him to become master of the lodge but Arron proved that the time was also right for him to perform the master’s song. Both were major successes and Fraternal Lodge can look forward to another year of triumphs and fun. Pictured from left to right, are: Ted Rhodes, Ron Weatherill, Stuart Thornber, Ian Ward, Frank Conway, John Houghton, Peter Smith, John Turpin, Roger Perry and David Kenworthy.